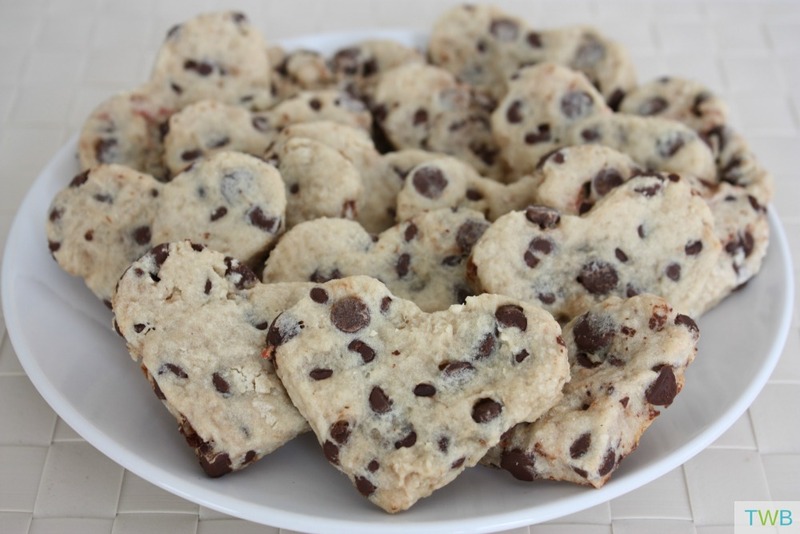 Heart Shaped Chocolate Chip Cookies – Why they came about. Before having kids, I was a bit of a skeptic about Valentine’s Day. I felt like it was just there to make us spend money unnecessarily on unnecessary things. After becoming a mother though, my views have changed a bit. Now I’m actually really happy to have a special day to celebrate the love we express all year round. It’s also a great excuse to dole out more hugs and kisses! Each year, we try to do Valentine crafts and homemade cards. This year, I’m teaming up with some of my favourite bloggers to bring you Handmade Valentines (You will find links to all of their fabulous ideas at the bottom of this post.) My contribution is our family Valentine tradition of making Heart Shaped Chocolate Chip Cookies. It took a while to figure out a recipe that was tasty, could hold a heart shape and contain chocolate chips (because my kids are obsessed with chocolate chips, a trait they get from their father) but I finally did. They taste wonderful and look great, a winning combination! 1. Combine the softened butter, sugars, vanilla and salt in a large bowl and beat with an electric mixer until it’s creamy. 2. Add the egg yolk and beat it. Slowly add the flour and beat it again. 3. If you want to make it red, here is where you can add and mix it in. 4. Then add it the chocolate chips. Troubleshooting: If your dough is too dry (mine was) add a little bit of water at a time and knead it in until it has a more dough like consistency. 5. Split the dough into two, cover it and refrigerate for about an hour. 6. 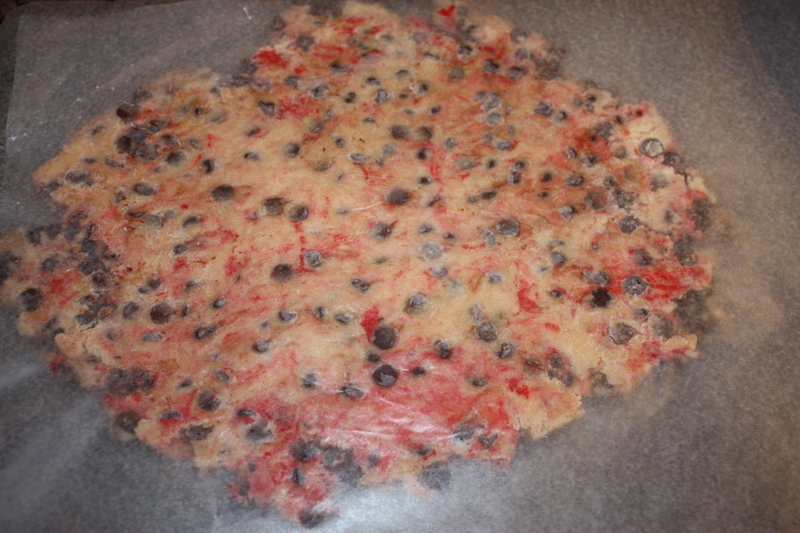 When you take the dough out, put it in-between two pieces of wax paper and roll it out. 7. 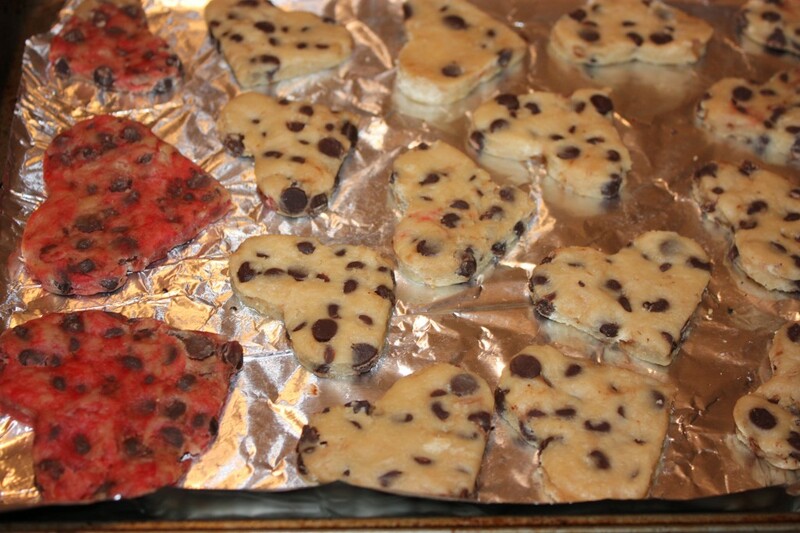 Take off the top layer of wax paper and use your cookie cutters to make heart-shapes. This is the part the kids will enjoy helping out with the most! 8. Once you’ve done the same with the second part of the dough, place the cookies on a greased sheet and bake them in a 350 degree preheated oven for 10-12 minutes. 9. After you take the cookies out, let them cool for a few minutes and then your heart shaped chocolate chip cookies will be ready to eat! These cookies also work great as a classroom Valentine treat and even as part of an easy Homemade Valentine Card. I’m also very excited to share with you some other wonderful Handmade Valentines ideas from bloggers that I love. Each one is different and fun! Bianca from Bits of Bee is having fun with 10 Punny Valentine’s Day Cards for Kids. Tairalyn from Little Miss Mama has a perfect gift for your bestie for under $10. Jen from Mama Papa Bubba is sharing a fabulous Glow Stick Heart and Arrow Valentines that the kids will love. Make sure to stop by and visit each of their Handmade Valentine Ideas, I promise you will love them! The fact that they hold the shapes are the best part! How fun!! I love baking cookies with my girls. 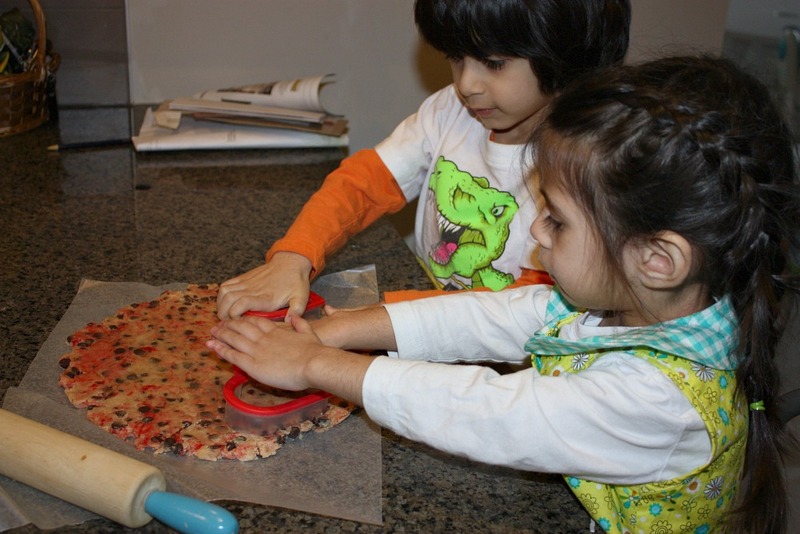 Thanks for the recipe, and making them into fun shapes will be a great surprise for my girls! I’m so glad! I hope you all have fun! Awesome! Are these chewy or crunchy? I’m totally sold on a chocolate chip cookie that will hold different shapes. What a great and fun idea for any holiday! I’m glad you like them Meaghan! Such a fun project for children. If the children aren’t nut intolerant,some walnuts (or peanut butter chips) would be a great addition. Also, trying to figure out if there is a natural food color that will work with this. I’ve never tried peanut butter chips but that sounds delicious!